Safety is paramount at home and work. To safeguard people, products, and places, Underwriters Laboratories (UL)—a global independent safety science company with more than 100 years’ experience—created the UL Mark, which is the most accepted certification symbol in the U.S. According to UL, each year global manufacturers make more than 22 billion products that comply with their stringent guidelines. In fact, you’ll find UL barcode labels on everything from appliances to electronics, medical equipment to motors. These compliance labels signify that products meet the highest standards for safety—a boon for manufacturers competing for customers. Most manufacturers comply with UL label requirements, yet sometimes systems break down or the quest for cost savings prevails, resulting in products that don’t adhere to UL standards. When companies are found to be non-compliant, fines, lawsuits, and tarnished reputations pile up, injuring once-reputable brands who may find themselves struggling to recover. UL compliance starts with the right barcode label. Avoid fines, lawsuits, and tarnished reputations by complying with UL requirements. In response, JM Eagle filed a defamation lawsuit against Phillips & Cohen, claiming that their comments harmed the pipe manufacturer’s relationships with its customers. The libel case is currently under review after a judge agreed that the law firm misrepresented the ruling in its release. As this example suggests, the cost of noncompliance doesn’t pay off. Production shortcuts lead JM Eagle down the path of never-ending lawsuits, where legal expenses, fines, and a damaged public image are circumventing profitability at every turn. Cutting corners is one of the things UL tries to prevent as part of their mission to protect public safety by keeping dangerous products out of the marketplace. To achieve their objective, the respected non-profit with more than 60 labs, 188 locations, and 6,000+ employees writes safety standards, tests products, and issues certifications for manufacturers of products such as electronic equipment, electrical components, appliances, fire protection equipment, radios, and wire and cable. They also make unannounced audits to ensure companies are complying with their UL certification requirements. Failure to do so results in stiff fines, such as the $10 million hit Keurig took when 7 million of its UL-certified, single-serve brewers were recalled. Regulatory authorities—such as the Federal Communications Commission (FCC) and the U.S. Department of Labor Occupational Safety and Health Administration (OSHA)—value UL’s contributions. In fact, they work closely with UL and its customers, insurers, retailers, and consumers on research, technology, safety, and education initiatives. This approach ensures regulations represent a broad range of interests, both nationally and internationally. The UL website explains the process for securing UL certification. To summarize, companies must request UL approval before adhering UL labels to their products. If the products change at any point, manufacturers must resubmit their designs for approval. There is a fee associated with the certification process, which typically takes less than 90 days. Once products are certified, companies can purchase their UL labels. Some manufacturers opt to print their labels in house after consulting with a labeling expert about their specific requirements. Others prefer to purchase UL labels that are partially printed, while others require custom labels. Regardless of the preference, UL labels must adhere to stringent guidelines regarding their use of materials and ribbons. Only certain material/ribbon combinations are approved for certain products, and they must be printed by UL-authorized print centers. System ID works with authorized UL printers, such as Zebra, to ensure every label is correct. Armed with companies’ specific UL certification requirements, System ID, a Premiere Zebra Business Partner, orders UL labels with the mandated information—such as a company’s UL file number, UL mark, and denominations—and ensures they meet the highest standards of excellence. 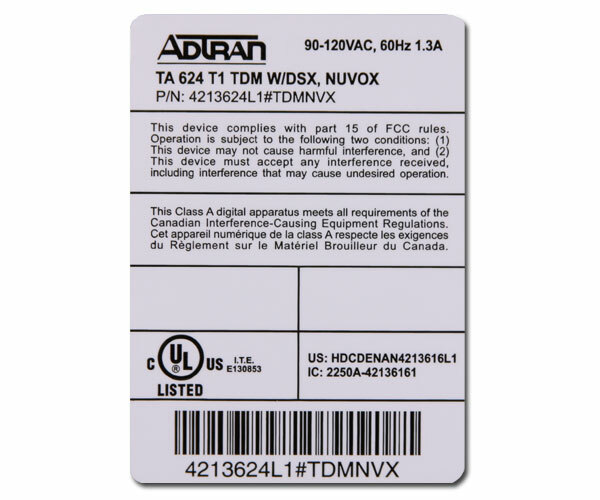 Vent-A-Hood, a leading manufacturer of range hoods and ventilation products, uses UL labels to signify its products’ compliance with UL requirements. For more than 10 years, they’ve trusted System ID to deliver quality UL labels that meet a variety of needs and certifications. “That level of service is what keeps us coming back,” added Cocke. Do you need help selecting and printing UL labels? System ID labeling experts can help. They know the right combination of materials and ribbons to ensure compliance with UL/cUL regulations. They also have extensive experience with barcode labels used in manufacturing plants and warehouses. Give them a call at 888.648.4452—they are happy to answer any questions you may have.